I got some cheap and decent foam eyeballs from Michaels (posted in the Eye-rises flower thread I just made). 4 eyeballs for $1, not as good as homemade, but good enough for what I work with. The fact that they are foam means you can cut into/melt them so that works even better than the pingpong balls for this project. I used the glue gun to trail out lines of glue like the eye muscle would be, but went over the area a few times so as to get a more organic effect. I used a ceramic plate for this so as to make the glue once cooled easy to peel up. I actually wet it down with some cool water and stuck the whole thing in the freezer for a few minutes, and they peeled right off. Once I had the glue muscles the way I wanted, I peeled them off the plate, used a bit of red and mostly black to paint the whole thing. Let that dry, went back over it with a half red half black so it was a deep red color, but only on the high points and sort of tracing the main lines down the muscle. When that dried, then straight red as a very fine tracing over the highest points. I used the glue gun to melt into the foam eyeball slightly (the general depth/width of the wide part of the muscle where it would attach) and then glued the muscles into/onto the eyeball. I had to hold it in place as it dried, but I didn't get any of the hot glue on me as I used a VERY small amount. I then took the two muscles and pinched them together and applied a small amount of glue at the juncture to make them meet, and there was a nice skinny section at the top that I inserted and then glued into a small hole in the beak (cut in carefully with Xacto knife). 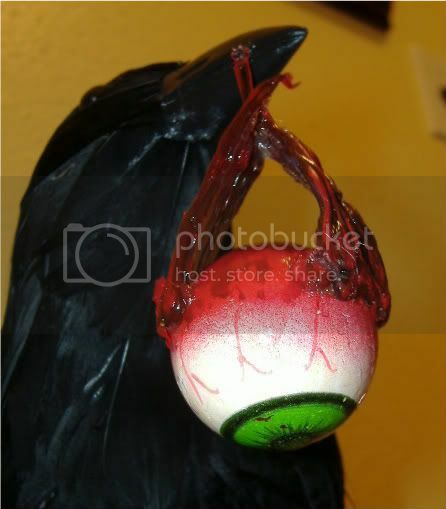 I did a small tail of glue on the opposite side of the beak to look as if the raven was holding the muscle. I did some minor touch-up painting with red on the new glue bits and over the back of the eyeball to get the reds to match a bit more, then coated the entire muscle/eyeball with polyurethane to get it REALLY glistening. The cool part is that with the eye hanging with the pupil straight down, the excess polyurethane formed a cornea effect at the bottom... happy accident, but it looks so real. The eyeball also swings easily with the slightest movement. Wow FrankieGirl, give you $1 and 4 eyeballs and look what you can do!! I loved the flowers and absolutely love what you have done with the 4th eyeball. It looks so realistic to me. This is one I've got to do for sure. Maybe I'll add him to my monster's lab--picking on the body parts. BTW did you use clear hot glue for this? Thanks for the tips on the foam eyeballs over the pingpong ball type. Man this looks good! Absolutely disgusting.... but so cool! Support bacteria - they're the only culture some people have! that is way to cool!!! if you don't mind, i'd like to use the idea in my display. it would fit in with the zombie BBQ..... perfect name by the by!!! Yup, clear glue sticks. It allowed me to just paint the top surface, and the red shows though the back, so you don't have to paint the insides if you don't want to. I love this idea too, as well as the "eyerises" you did! 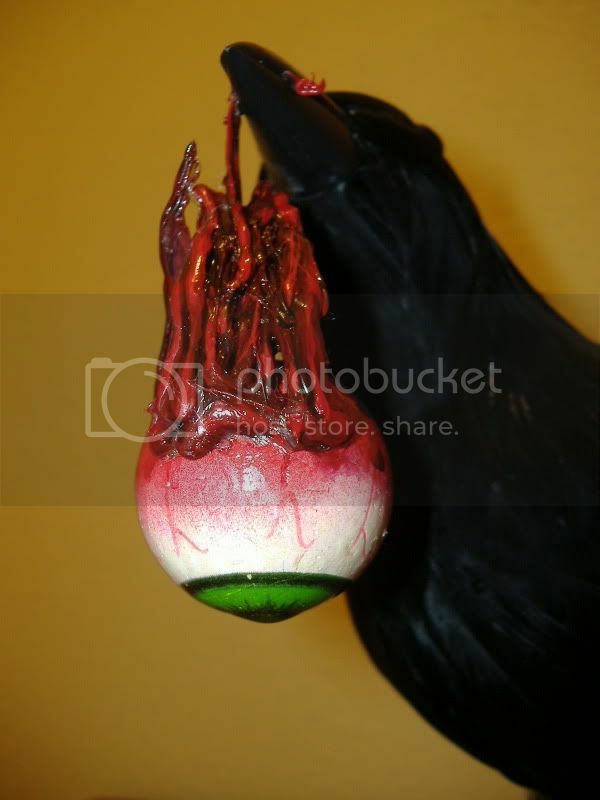 I might want to do something along these lines as an eye hanging out of a skull or ready to be eaten in my cannibal display. Thanks for the idea and in-depth tutorial. Duct tape is a ghoul's best friend. That looks fantastic!! I love it! I don't usually go for the gore, but that is great! I'm gonna have to copy that and put a feasting crow on the Slaughtered Lamb. Oh, that is just too cool!! Well done, pretty lady. This is exactly what I want and I am soooo jealous. 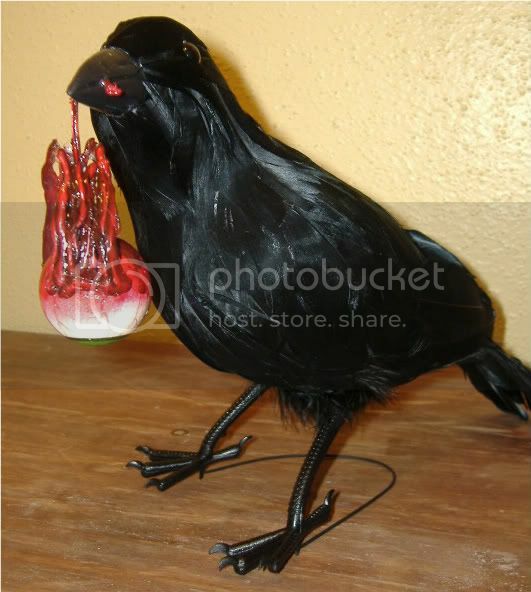 I can't find a crow/raven in Oz at all and bringing one in from the US seems expensive on postage from the online suppliers. Anyone willing to help out? In my house with my wife. I usually keep an eye out for good props, haha, and this one is really nice. Great job.